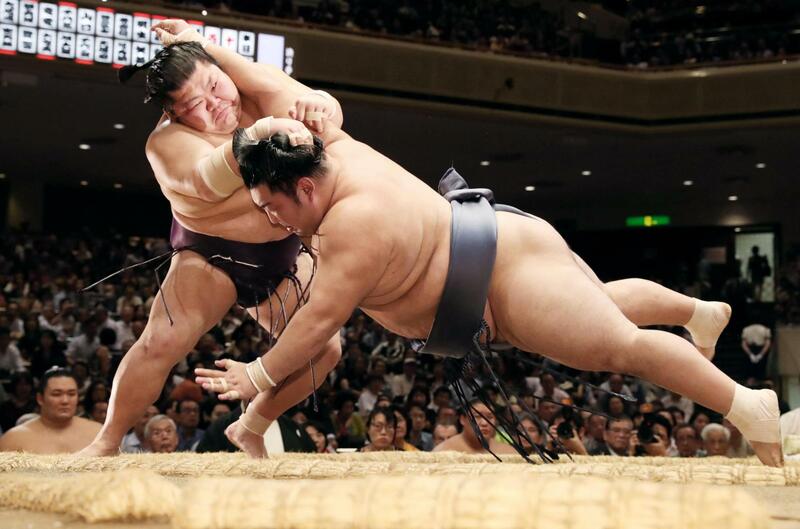 Ozeki Goeido stayed on course for his second career championship at the Autumn Grand Sumo Tournament on Thursday, despite a surprise second defeat at the hands of fourth-ranked maegashira Shohozan. The loss in the day’s penultimate bout at Ryogoku Kokugikan saw Goeido fall to 10-2, but defeats to his three closest challengers — rank-and-filers Asanoyama, Takanoiwa and Chiyotairyu — mean he is still two wins clear with three days of the 15-day tournament left. 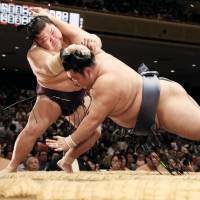 A total of 10 wrestlers including lone yokozuna Harumafuji, who earned a force-out win against komusubi Tamawashi (5-7) in the day’s finale, are tied for second with 8-4 records. After twice jumping the gun at the tachiai charge, Shohozan (6-6) got off to a good start and kept Goeido at bay with a series of slaps and next thrusts. Goeido tried in vain to pull Shohozan down, but the maegashira stayed on his feet and then sidestepped the ozeki before slapping him down for the win. Goeido, who won his first career title with a 15-0 mark at this tournament last year, faces fifth-ranked maegashira Takakeisho on Friday. Asanoyama, a No. 16 maegashira making his debut in the top makuuchi division, was outmuscled by ninth-ranked Arawashi (8-4), who rebounded from defeat a day earlier and secured a winning record.